In 1940, Beatrice Sims, a spoiled English girl arrives in Santa Fe to escape the war in London. At first the twelve-year-old hates the dusty little town. But soon Beatrice makes friends with goofy Arabella, develops a crush on handsome Esteban and aids Ana, a shy Indian girl. First accused of being faceta - stuck up, Beatrice learns to change tires, ride wild ponies and helps the public health nurse, Clementine Pope, rescue a sick baby on an Indian pueblo. TRUE BRIT - Beatrice, 1940 was inspired by accounts of children who were sent to Santa Fe and elsewhere in the United States to escape the war in Europe. The book is the first of a series titled Far and Away, which features young people displaced and relocated between 1939 - 1945. The second book in the Far and Away series is tentatively titled Forced Journey - Werner, 1939. This story features the struggles of a young Jewish boy from Germany who is sent to live with a distant relative in New York City. Other books in the series will feature young adults in Britain, Germany, the United States, and a return visit to Beatrice in Santa Fe, as they deal with their lives changed by World War II. Use True Brit in the classroom! Download the free discussion and activity guide. True Brit is now available as a downloadable e-book from Amazon Kindle. Download a copy of True Brit for only $2.99! Check out this video trailer of True Brit! 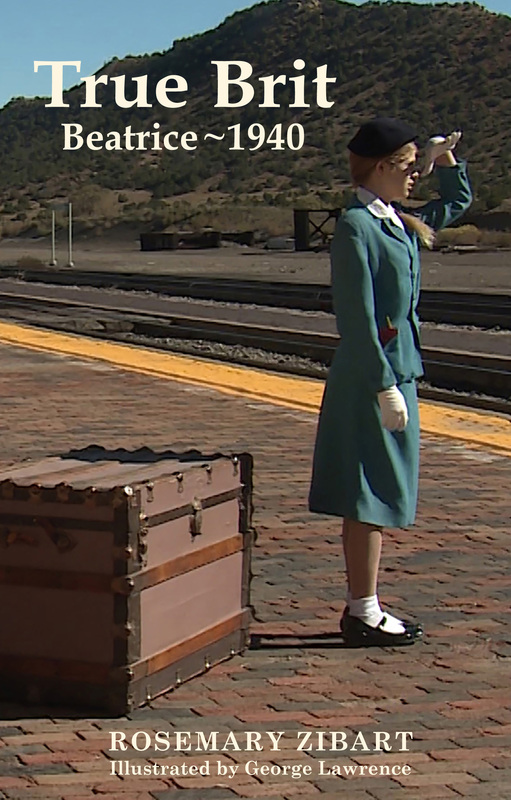 Filmed on location at the Lamy train station where Beatrice first arrives in New Mexico! The story is simple but engaging, as appealing for adults as it is for children. The portrayal of Santa Fe in the 1940's is reminiscent of Richard Bradford's Red Sky at Morning, with its entrancing mix of people and cultures that existed in the city before the advent of urban sprawl. What makes Rosemary Zibart's True Brit most engaging is the attention to detail, from descriptions of mud homes and pinon trees to "A-okay" American slang. Beatrice's journal entries add more insight into her evolution from a privileged girl to the beginnings of a modern woman. The first in a series, this fresh take on the era will continue with more stories about displaced children during World War II. True Brit - Beatrice: 1940" achieves what a historical novel should achieve. It informs and entertains and the two elements combine to make the learning lasting. There is nothing more terrifying than having one's child in a warzone. True Brit: Beatrice, 1940 is a historical novel drawing from history of many British people who sent their children away to Santa Fe and other places in the United States for safety, to keep them from the vicious war that would be fought in the skies over London. Terrifying for the children and parents being faced with a whole new world and concern over the home the left behind, True Brit is a fine read for younger readers that is educational as it is entertaining.